Miami’s most expensive single-family home sale ever was recorded yesterday, and there are hints of a connection to Qatar. Angouleme Holdings II Limited Land Trust paid $49.9 million for 3 Indian Creek Island Road, county records show. Bermuda records show a company with the same name registered there. Abdulhai Mana Al-Hajri is listed as the manager. According to a 2015 article in the Daily Sabah, Al-Hajri was also listed as the manager for a company that purchased Turkey’s most expensive home for for 100 million euros. The actual “secret” buyer behind the deal however was said to be his son-in-law, Sheikh Tamim bin Hamad Al Thani, who is the Emir of Qatar. The 38-year-old Emir’s $300 million yacht Katara was docked at Museum Park in January 2018. 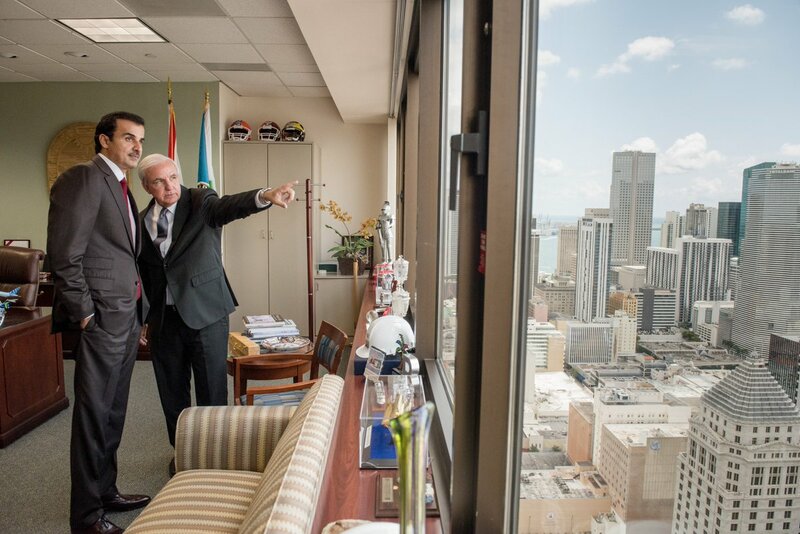 He also met with mayor Carlos Gimenez in April. It is the second time the home has set a Miami record. In 2012, it was sold for $47 million, the highest ever residential price in Miami at the time. The company that sold the home is AVK Land Holding LLC. Little is known about the seller either, other than it is managed by Russian lawyer Andrey M. Kaydin. The money some people have is absurd ..
Take a look in Google maps. It’s a postage stamp. How in the heck is it worth ~ $49M? I have now taken sides with Qatar in the dispute with the other Gulf States. 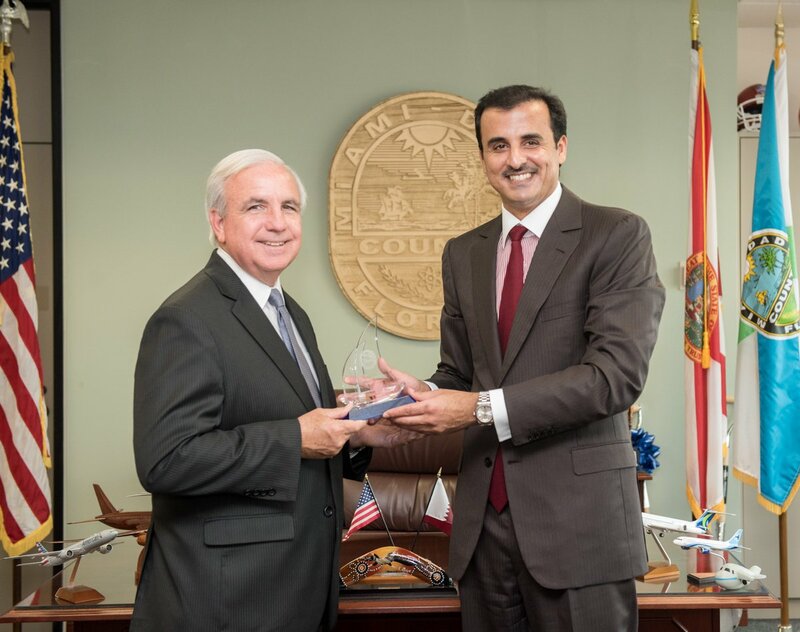 First photo, Carlos Giminez showing Tamim bin Hamad Al Thani where he plans to put future double decked highways. I saw the post above as a joke too, and while what you said is true, I wouldn’t underestimate Gimenez’s ridiculousness in “proposing” one somewhere there even if it isn’t feasible. Is he giving as a present a model bus which looks like a train? https://www.youtube.com/watch?v=4GSpQNytbqw – Video of the home if you are wondering what it looks like! I watched that whole video and did not see one theater room.. that’s a deal killer for me. I bet if it was a Russian, everyone would be flipping their lids despite the fact Qatar makes Russia look like a bunch of pious Quakers.